It is that time of year again when Santa is looking for the perfect gift. And how often do you hear (or wish you heard!?) "gift cards, please." Gift cards sure make shopping easy -- but what do you do if you want to make the gift a little more personalized? 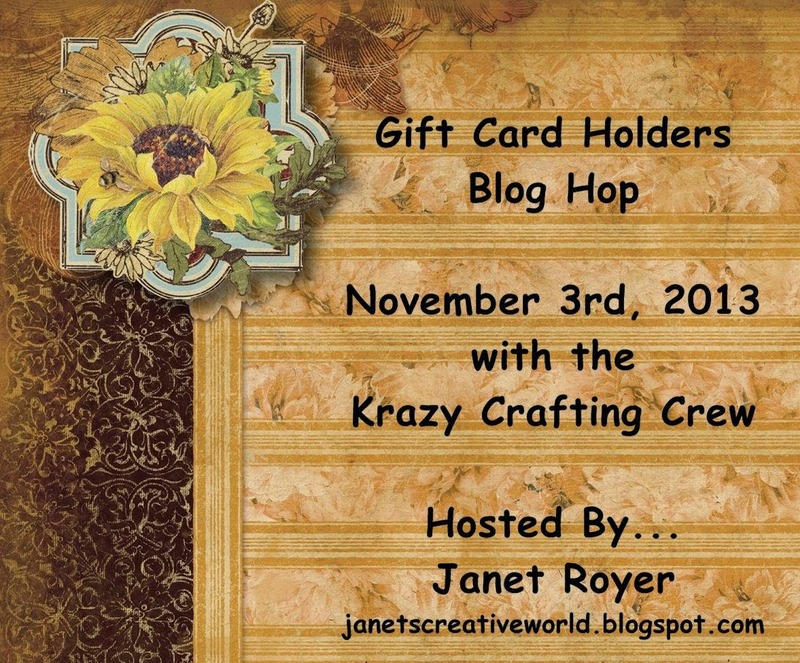 Well, if you were a member of the Krazy Crafting Crew or if you'd like to follow our lead, you will have made some gift card holders to have on hand to make your gift giving all the more special this holiday season. 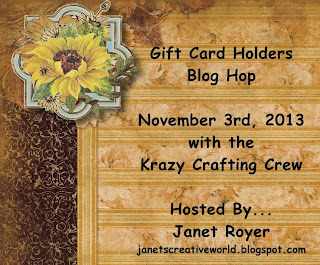 On this very special Hop hosted by Janet Royer, you'll find crafters' ideas to make your own VSGC's (*Very Special Gift Card) Holders. Be sure to hop on through and leave comments to be eligible for blog candy sponsored by our hostess. 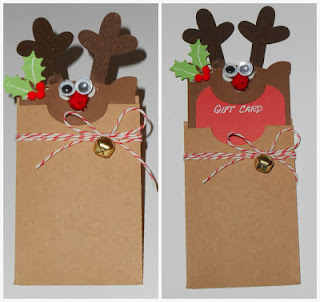 For my project, I made this adorable "library card jacket" stuffed with a sweet reindeer that holds a gift card. The cut is by Silhouette's Online Store. I added the googly wobble eyes, the small pom-poms at the holly and the sparkly pom for the nose. The holly is punched using a Martha Stewart punch. I tied on baker's twine and a darling jingle bell. Don't miss it! Your next stop is with MIRANDA at Nana's Scrap Spot. Thanks for stopping by today! Please come back to join the Krazy Craftin' Crew on December 1st when the plan is to show off a Desk Set of some sort that we've made. Ellen,you did an amazing job as always,your reindeer is so cute. Thanks for sharing. 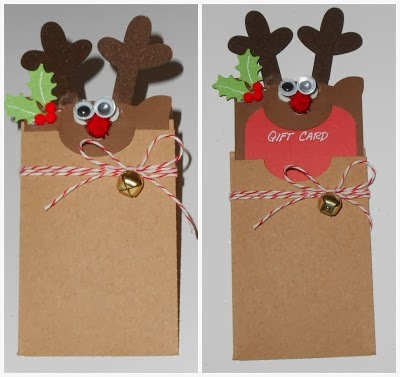 Ellen, your reindeer gift card holder is adorable! Your never cease to amaze me!!!! what a cute gift card!! Love it!!! Thanks for joining me today. Happy Holidays! awe, cute cute cute! I so love this one! Your gift card gave me a little giggle this morning. Love the reindeer. That little reindeer is so cute. I think I may try this. Oh these are adorable. Love all the embellies you added to make it special. TFS. Cute as can be. I love how the card has an interactive pull up. Very fun. Oh how cute! Thank you for sharing! What a wonderful gift card holder. I thank you for inspiring me! Cute, cute, cute! Love the bell and layout. Grat gift card. Oh I know we spoke and I told you I loved your project but I have to just say it one more time! Love the simplicity of it too, that's definitely my style! Love it! I absolutely Love Pull-out cards! Great job. I love this! How cute his little antlers are, sticking up out of there! What a great idea! Ellen your gift card holders are just darling!!!! Love them!! Oh my goodness! This is so cute! I definitely will be casing this one! Thanks for sharing! Love it love it love it!!! Great job on your gift card holders:) Thank You for sharing. That is adorable!!! Thanks so much for sharing your beautiful card!! Adorable! I like the googly eyes and jingle bell. That is simply adorable! Thanks for sharing! adorable! love the wiggly eyes!